As an SF roleplayer (at least in theory) I have been wondering why it is that I have always focused on hard-SF or serious-SF games, such as Traveller, and never played Shadowrun. With a new edition of Shadowrun in production (see Catalyst Games’ website: http://www.shadowruntabletop.com) and due in the Summer, I’ve been delving into the system a little more than I have previously. Yes, there’s a new edition of the game coming out. 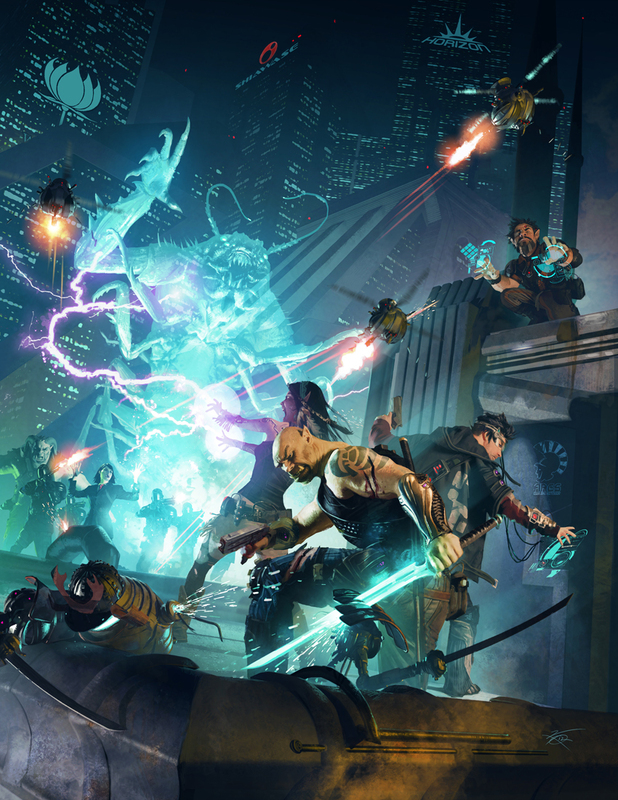 There’s also a tabletop skirmish game, a card game and a computer game coming – the Year of Shadowrun. With some curiousity, having bought the 4th Edition back in 2004/5, I have been reading the Preview Files – there are 3 out at present, and they are free to download. Shadowrun 4 didn’t resonate with me. At the time I wasn’t interested in a fantasy-meets-cyberpunk setting. The art was too cartoon-like and seemed to not treat the idea of urban fantasy seriously enough for my taste. Nine years on my attitudes have obviously changed. Shadowrun 5 seems to resonate. Why? For me the two genres have been separate in my mind. I have used terms like “Star Fantasy” or “Urban Fantasy” to talk about the kinds of games that I want to play… and ignored Shadowrun‘s blend of SF. That seems odd, when I think about it. Yet, when I read Traveller5 I felt disappointed by two things: 1) the dodgy nature of melee combat; 2) the lack of a decent Psi / Magic system. I never expected Marc Miller to include a magic system… but I was deeply offended by his dismissive and offhand treatment of Psi. Offended? YES! You see, in recent years I have come to regard the position of scientific supremacy as questionable. I have at the same time been having a lot of fun with fantasy elements in my gaming. When you bring together my doubt in the Scientific Priesthood with my love of a good fantastic yarn, you get something that isn’t Traveller. It’s something that looks more like Shadowrun. I like this description. It appeals to me… and it makes me want to grab a character sheet, a handgun and a spell book. Magic cyberpunk noir. What do I want in my SF? It’s weird. I started writing Serene Dawn recently and I included magic, angels, demons and conspiracy in my top five elements… the fifth was an “alternate future”. If you’re looking for a sci-fi RPG you can really sink your teeth into, this is the one. Shadowrun is quite possibly the richest, most detailed, and most beloved sci-fi RPG setting I have ever played. The way the rules and fiction are presented in this rulebook quickly dispels the “cyberpunk with namby-pamby elves” stigma (which usually originates from people who write off the game without really knowing anything about it). On the contrary, this book makes Shadowrun’s world of magic and technology come alive. What’s odd to me is that this change has taken me around 30 years to notice. In fact, looking back, it’s not really a change of taste… just of attitude. When I was playing Star Frontiers back in the 1980s I was indulging in pulp SF. It’s not too big a leap to my position today, really. It’s just that my attitude to mixing fantasy with science-fiction has finally let me accept the concept without sneering. This lends me to think about my intellectual snobbery once again: why have I, for so long, seen fantasy gaming as a secondary and less serious indulgence than playing SF games? They are both made up, imaginary… dare I say it, fantastic?! Is the scientific illusion so ingrained? Not any longer, it seems. Thank you, Shadowrun 5! You’ve opened up my eyes to something fun!